The Bassett Creek Watershed Management Commission (BCWMC) received good news from the Metropolitan Council Environmental Services (MCES) that water quality in Bassett Creek has improved over the past five years. The MCES reports that concentrations of pollutants including sediment, phosphorus and nutrients have decreased in the creek since 2009. The concentration of chloride, however, has increased over the same period. MCES’ evaluation of the Bassett Creek monitoring station data shows that over the last five years, the total suspended solids concentration in the creek has dropped by 30 percent, the nitrate concentration has dropped by 27 percent, and the phosphorous concentration has dropped by 17 percent. Since 2000 the MCES has operated an automated water monitoring station on Bassett Creek to determine the extent of non-point source pollution and to measure progress toward achieving water quality goals. The station is one of twenty-three the MCES operates in the metro area. The BCWMC partners with the MCES to collect water samples and maintain flow records. 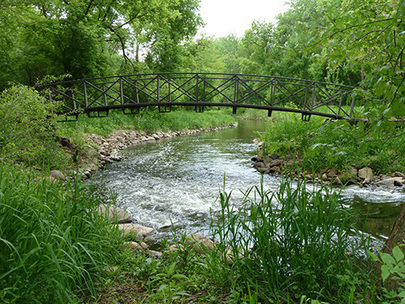 Prior to 2013, the Minneapolis Park and Recreation Board acted as the local partner. The MCES used statistical software to identify the water quality trends and noted that factors affecting water quality vary from season to season and year to year. For more information and a fact sheet see “Mississippi River Tributary Streams” on the Met Council’s Stream Assessment web page. 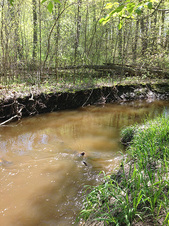 The City of Plymouth, in cooperation with the Elm Creek Watershed Management Commission and Hennepin County, is proposing to stabilize, restore and enhance 4,500 feet of the Elm Creek main stem just north of Wayzata High School. This project aims to improve the water quality and habitat of Elm Creek so it can better support the fish and macroinvertebrates (small critters and bugs) that call the stream home. This project will begin in 2015 and will use bioengineering techniques to stabilize streambanks and improve habitat. Structures such as root wads and rock veins will be added to the stream and the vegetated buffer along the banks of the stream will be improved. In addition to improving habitat, stormwater flowing from high school property will be routed through areas of sand filters that are enhanced with iron to remove phosphorus from the water. Overall, the project will reduce the amount of phosphorus coming from this stream section that currently feeds algae in downstream wetlands, Rice Lake, and ultimately the Mississippi River. The phosphorus reduction from this restoration project is estimated at 94 pounds per year. This project will help to enhance the habitat, improve the water quality, and increase the biotic integrity in Elm Creek. If you have any questions about the project, contact the City of Plymouth at 763-509-5500. Bees, butterflies and other insects pollinate a wide variety of fruits, nuts, vegetables, animal forages, fiber crops and native plants. In fact, one third of our food production requires pollinators, and fruits like apples and blueberries rely solely on insect pollinators for their growth. 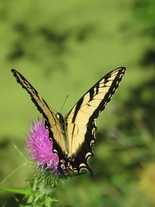 There is no doubt that pollinators are a critical part of a functioning ecosystem. There is also no doubt that insect pollinators are disappearing at alarming rates. Loss of plants and nesting habitat, disease, pesticides – there are a number of factors contributing to their decline. We all have a role to play in reversing the trend. Minnesota is home to a wide variety of pollinators, including more than 400 bee species as well as butterflies, moths, beetles, flies, wasps, and hummingbirds. Everyone can do something to help pollinators. Simple acts, such as planting more flowers that attract pollinators, leaving ornamental grasses uncut in the fall to provide habitat over winter, or using pesticides only when necessary, can make a big impact. Learn more about best practices for pollinators from the Pollinator Friendly Alliance or the Minnesota Department of Agriculture. How you care for all the green and growing things in your yard can have a big impact on and how much waste your household creates and on Minnesota’s air and water quality. From grass trimmings and leaves to pesticides and water, the eco-impact of your lawn and garden can be significant. Your lawn and garden can add a lot to what your household needs to discard and recycle. Healthy lawns and gardens can be maintained in ways that produce less waste, and you can easily manage what's left by composting at home. A healthy lawn and garden can naturally resist weeds and pests. You don't need a lot of chemicals to keep your yard looking green. Learn to read the signs and find out what's really wrong with your plants. Solve your lawn and garden problems by applying some brainpower before you use pesticides and herbicides. Mow your grass to a height of 2 ½ to 3 inches. Keeping your grass a little longer is the single most important thing you can do to improve the health of your lawn. This allows the roots to grow deeper, enabling them to reach more water during dry periods. Longer grass also helps shade the soil surface, making it harder for weeds to get established. Wait before you water. In Minnesota, most grass can survive without watering, although it may enter a dormant “brown” stage during the summer. Water only when it hasn't rained for at least seven days. You don't need to water on a routine basis. Water more effectively. To get the most water to the plant and reduce evaporation, water early in the morning, water close to the ground, water slowly, deeply and less frequently, and only water grass (not hard, impervious surfaces).